When someone takes their own life, how often do family and friends wonder if they could have done something different to help that person, and would another approach have changed the course of events? Take a Minute is a forum theatre production, presented by Cardboard Citizens in collaboration with Mind in Haringey, London, which tells us Jed’s story and allows us to explore those questions through dialogue between the actors and audience. In five short scenes we see that Jed (played by Andre Skeete) seems to be drinking too much, seriously struggling with money, separated from his son by his inability to pay child maintenance to his ex-partner, and under-performing at work. He gives his sister Mel (Carly Jane Hutchinson) the treasured watch his grandfather left him. Mel and her partner Rob (Alex Jones) are concerned about him and try to engage with his problems, but have their own life pressures. Jed is not able to open up and say how he truly feels. Kate, his ex (Jo Galbraith), is unmoved by his financial problems and his boss is abusive in her attitude to his sick leave. The final scene shows us the sad aftermath of Jed’s suicide. So far, so usual, there are many plays about men experiencing depression and suicidal feelings, but Forum Theatre – a type of interactive drama developed by the Brazilian theatre director Augusto Boal – takes us to a deeper level in which alternative scenarios can be explored. The audience can stop the action at any point and join the actors on stage to try an alternative approach. Examples of interventions include offering Jed more time to talk, fostering a sense of hope and purpose, and bolstering his feelings of self-worth, while one audience member asks directly about suicidal feelings and tries hard not to let Jed evade the question. We are then invited to reflect on whether these approaches were helpful, and whether they would have made any difference – hard questions to answer, but a lively discussion takes place. The show was written for this scratch performance by Alex Jones, who included information shared in interviews and workshops by people who had been affected by male suicide, helped by Mind in Haringey, along with improvisation by the cast and his personal experience of having been a Samaritan. Cardboard Citizens theatre company comprises actors who are, or have been, homeless. 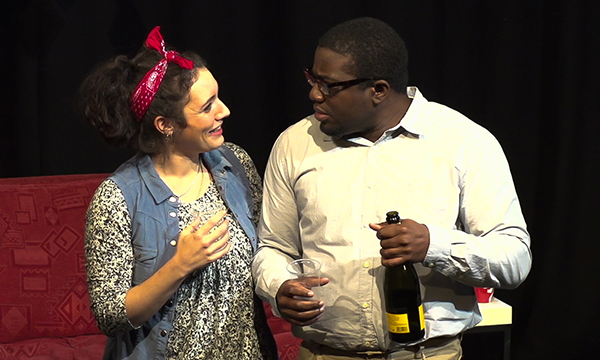 Working with actors who are marginalised in some way is an integral part of forum theatre. This project is the first part of a wider programme called Change Your Story being developed in response to increasing numbers of homeless people and the acknowledged links between homelessness and mental health. The performance clearly resonated with the audience, with many brave enough to offer personal testimony of their own difficulties, as well as suggesting ways of helping others. But I wonder how relevant this project might be to mental health service providers. Could performances of Take A Minute be used to inform and raise awareness among professional staff or local communities? Martin Bould, senior joint commissioner in the mental health joint commissioning team at Tower Hamlets clinical commissioning group (CCG) in east London, reminds me that suicide is a national priority for the NHS, and that levels of homelessness, unemployment, drug and alcohol use and the number of young people in the criminal justice system make Tower Hamlets a high-risk area for suicide. Working together to promote mental health and well-being is a priority for the CCG. They are exploring ways of reaching out to the community, recognising that arts and creativity are often a way for people with mental health problems to understand and communicate their difficulties. Forum theatre may prove to be a useful tool to help achieve this end.